By definition the President "shall take precedence over all other persons in the State" - but in reality we want the exact opposite. What was it about Mary Robinson, Mary McAleese and Michael D Higgins that made them successful and popular presidents? There's the argument that they all promoted human rights, women's rights, support for the vulnerable and peace on this island. Their CVs were weighed down with experience before being presented to the nation. And they were not shy about speaking their minds. But history suggests that voters have limited interest in a track record of good deeds, honest endeavour and political achievements when it comes to the presidency. Instead we want the type of man or woman we'd like to have around for tea and a chat. We're not seeking a ''president for the people'', we want a ''president of the people''. 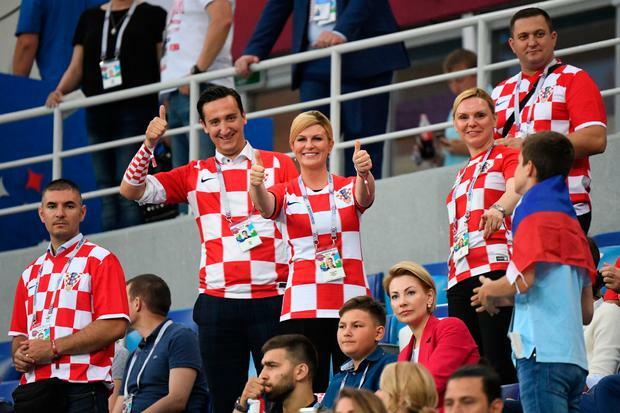 Somebody like Croatia's Kolinda Grabar-Kitarovic. It might sound naff - or even insulting to the highest office in the land - but relatability matters. Until two weeks ago it's likely that you never heard of Ms Grabar-Kitarovic - perhaps you still haven't. Over the course of the World Cup in Russia, she became an international role model as she donned her team's jersey, laughed in the rain and celebrated their second place finish. After Croatia beat Denmark, the mother-of-two wandered unabashed into the dressing room and hugged the semi-naked players, including Luka Modric. She travelled to Russia at her own expense on an economy class flight and watched some of the matches from the non-VIP stands. The only game she missed was the semi-final against England - but that was because it clashed with a Nato summit. Cynics say it was a carefully crafted pre-election marathon for the cameras but it seems to have worked. Ms Grabar-Kitarovic gained global recognition, with The Guardian quoting Mediatoolkit, a Zagreb-based analytics company, as finding 25pc more focus on her in news stories about the final than any of the players on the pitch. Four out of five of the stories were positive. That's not to say that she doesn't have political pedigree. She is a former ambassador to Washington and an ex-assistant to the Nato secretary general. But neither of those roles got her headlines such as: "What Croatia's president taught us about leadership at the World Cup." Back home we'd love that sort of feel-good publicity about one of our leaders - and to be fair Michael D Higgins has repeatedly achieved it. He pops up at random Bohs' games, gets pictured queueing at ATMs, and people seem to love the idea that his Bernese mountain dogs, Brod and Sioda, follow him everywhere around the Aras. He also had his own viral moment after throwing caution to the wind with his celebrations at the Stade Pierre-Mauroy when Robbie Brady headed home Ireland's winning goal against Italy to ensure their place in the knockout stages of Euro 2016. So challengers for the presidency need to be aware that they will have to bring some serious personality if they are to unseat President Higgins. The President has little influence over politics and is severely restricted from doing or saying anything that could be interpreted as either praising or admonishing the Government. So there is no point trying to argue that you have a better plan for the housing crisis and a definitive grasp of economics. That's irrelevant. 1. Don't embarrass us on the international stage. 3. Have a good backstory. 4. Be a bit of craic (but within reason). The country already knows that Michael D Higgins ticks all of those boxes - which makes mounting a credible challenge extra difficult for wannabes like senators Joan Freeman, Padraig O Ceidigh and Gerard Craughwell. They might think that their volunteerism, business links and willingness to provoke a bit of controversy will play well with the voters - but it's never as simple as that. On paper, Adi Roche (1997) and Mary Davis (2011) were ideal candidates who had superb records of helping those in need. How could anyone find fault with the director of the Chernobyl Children's Project? Easily, was the answer as Ms Roche discovered. Her campaign was derailed within days as ex-employees raised concerns about her management style and other issues. She would claim afterwards that smears were used to manipulate "anger and venom" towards her during an "appallingly dirty" campaign. Ms Davis, who is heavily involved in the Special Olympics, was also a likeable and worthy candidate, but was quickly dubbed the ''Quango Queen'' and finished last of seven candidates with just 48,000 votes. Hopefully, Pieta House founder Joan Freeman, who wrote to local authorities seeking support last week, has studied the fate of these two women carefully. In her note to councillors Ms Freeman promised a campaign based on encouraging people "to volunteer and to give back to their communities". She'll need more than that to compete with the dogs. As the former boss of Aer Arann and the man who chaired the committee which eventually ended the political bickering over water charges, Padraig O Ceidigh seems like a solid candidate. But is he ready for journalists to pore over all of his business accounts going back decades? The last businessman to take a run for the Aras was Sean Gallagher - and we all know how that ended. Then there is Mr Craughwell, who has led the agitation for an election. There is plenty of fodder in his background, not least the oath of allegiance that he took to the Queen when he joined the British Army. He recently described it as a just a few "silly words" but no doubt many voters will take a more traditional view. "I do a decent enough speech, I'm excellent at small talk and I have my photo pose polished to a fine art," he said, adding that he'd rather work on other projects at the moment "instead of having you guys poring over my life looking for a last skeleton stuck in the back of some closet somewhere". He added a "spoiler alert" that there are no skeletons left as he's already used them to flog a book and in any event he wouldn't run against somebody like Michael D.
So it's the incumbent's to lose, simply because the job is simple. Michael D Higgins is our Great Gatsby, whose personality is defined by "an unbroken series of successful gestures". It remains to be seen whether somebody can do it better.